99% polyester and 1% spandex features embroidered UMD graphics. One size fits most. Super-soft socks have a plush feel with maroon and gold ombré coloring. Please select option for Ombre Bulldog Head Fuzzy Socks by FBF. 100% polyester. This replica lace-front jersey is like the one players wear for home games. Features tackle twill UMD graphics and NCHC logo. Made in the USA, in Cloquet, MN. Please select option for Men's Hockey Replica 2018-19 Home Jersey by K1 Sportswear. 100% polyester. This replica lace-front jersey is like the one players wear for away games. 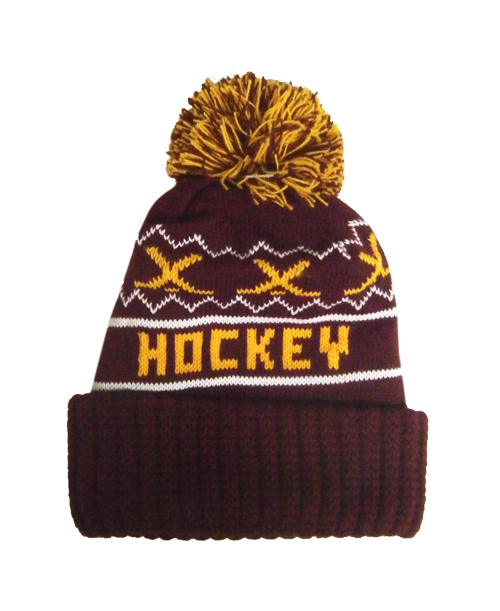 Features tackle twill UMD graphics and NCHC logo. Made in the USA, in Cloquet, MN. Please select option for Men's Hockey Replica 2018-19 Away Jersey by K1 Sportswear. 100% polyester. This replica lace-front jersey is like the one players wear for home games. 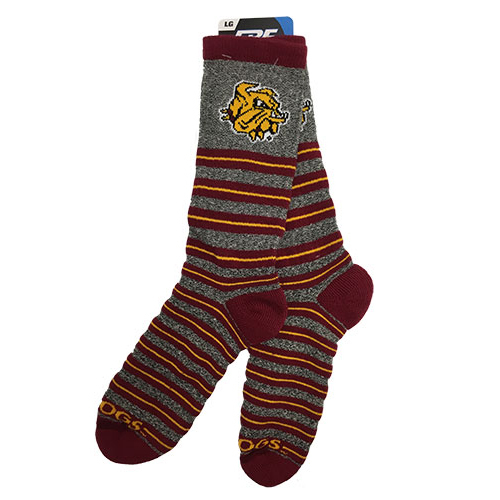 Features sublimated, fabric-infused UMD graphics and NCHC logo. Made in the USA, in Cloquet, MN. 100% polyester v-neck jersey. 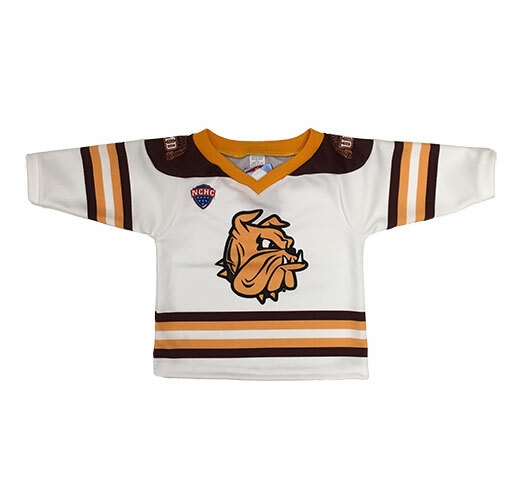 This jersey is similar to the one players wear for home games, but in toddler sizes -- perfect for the young Bulldog Hockey fan to wear on game day! Features sublimated, fabric-infused UMD graphics and NCHC logo. Tag at neckline. Made in the USA, in Cloquet, MN. 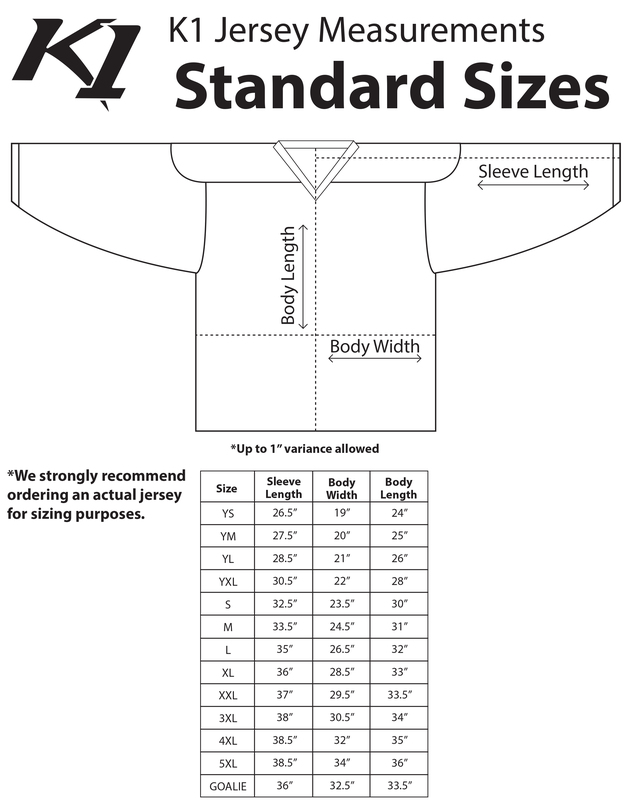 Please select option for Toddler Replica 2018-19 Home Hockey Jersey by K1 Sportswear. 100% polyester. 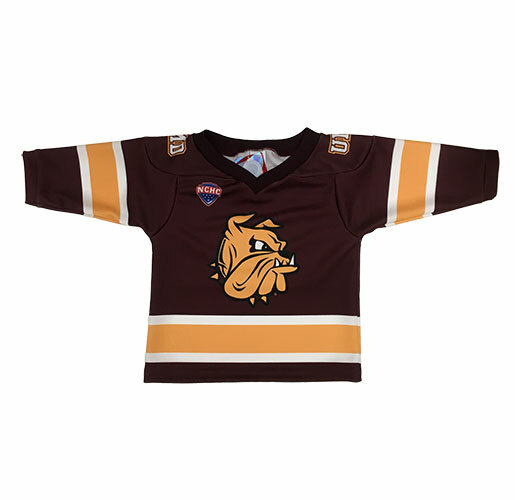 This jersey is similar to the one players wear for away games, but in toddler sizes. 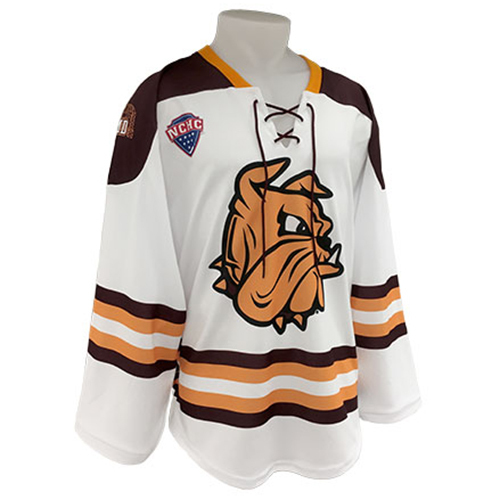 Features sublimated, fabric-infused UMD graphics and NCHC logo. Made in the USA, in Cloquet, MN. Please select option for Toddler Replica 2018-19 Away Hockey Jersey by K1 Sportswear. Socks are 30% cotton / 30% polyester / 25% stretch nylon / 15% acrylic with elastic cuff. 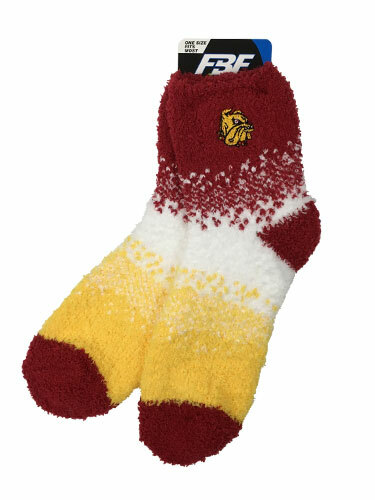 Features woven UMD graphics, with "Bulldogs" across the toe, and repeating maroon and gold stripes. Made in the USA! Please select option for *Striped Bulldogs Socks by FBF. 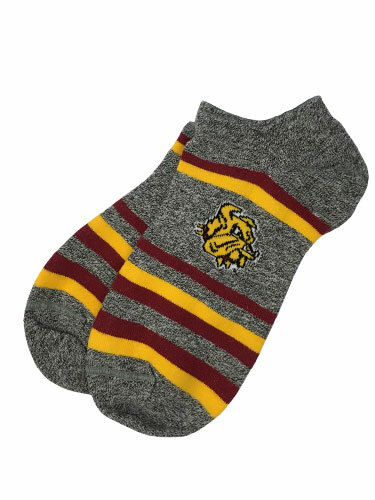 30% cotton / 30% polyester / 25% stretch nylon / 15% acrylic knit socks featuring woven UMD graphics. Made in the USA! 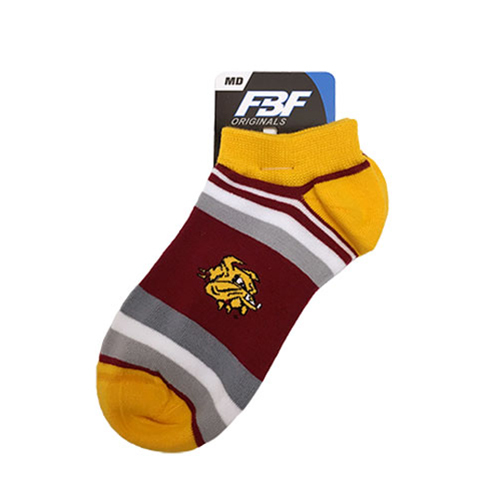 Please select option for Bulldog Head Ankle Socks by FBF. 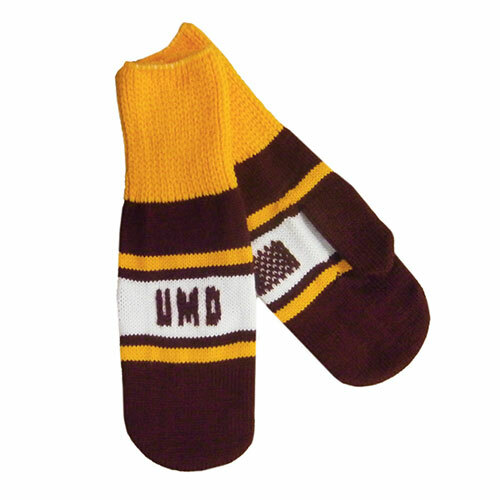 30% cotton / 30% polyester / 25% stretch nylon / 15% acrylic knit socks featuring UMD graphics. Made in the USA! 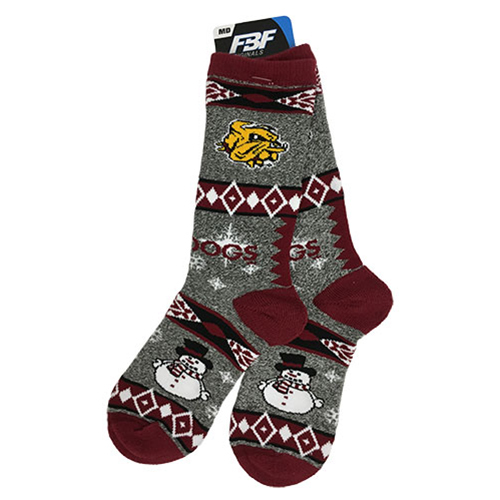 Please select option for Bulldogs Snowman Socks by FBF. 76% acrylic / 21% stretch nylon / 2% spandex / 1% rubber ankle socks featuring UMD graphics. Made in the USA! Please select option for Bulldogs Striped Ankle Socks by FBF.